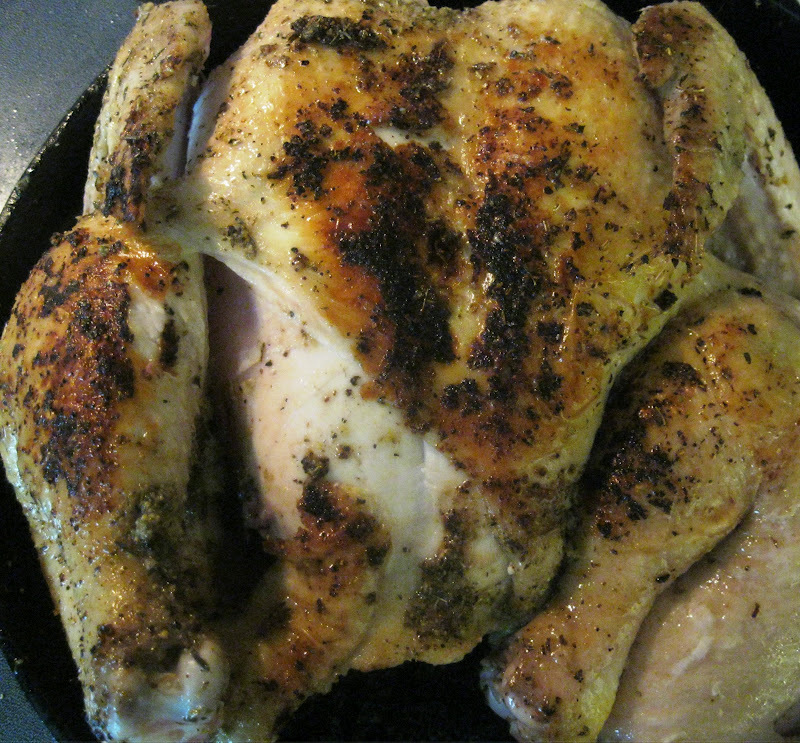 This easy skillet roasted chicken is quicker than a traditional oven roasted chicken. The chicken comes out moist and tender, and can even be cooked the night before and then used for quick sandwiches the next day or anything else you make out of those store bought rotisserie chickens. I often make mine on Sunday afternoons for an easy Sunday evening meal, or to pick apart during the week to speed up dinner on a busy night. I first learned the secret to this quick cooking dinner from an article in my local paper. The secret is that you cut out the backbone. 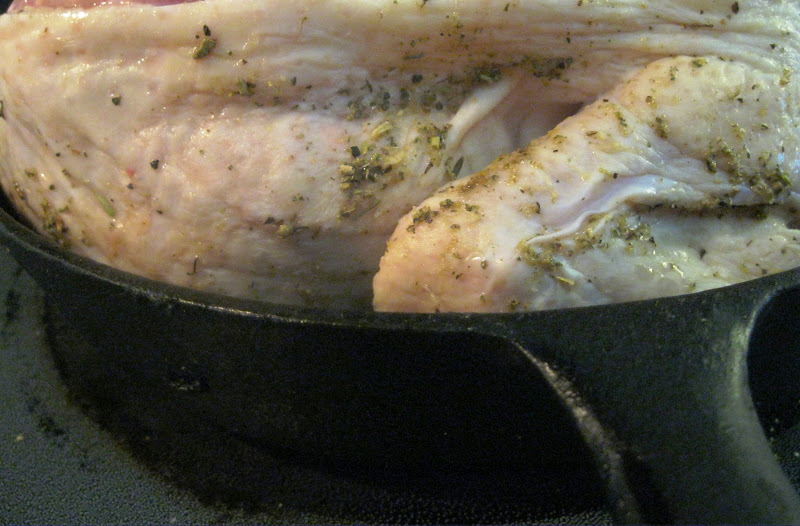 This allows you to flatten out the chicken in the skillet and reduces the cooking time significantly. Jan's Tip: If I want to cook the chicken up and serve it roasted for dinner then I usually cut out the spine the night before, dry rub it and store it in a ziplock bag in the refrigerator till about 30 minutes before dinner and then follow the cooking directions below. Or, If I want it to make cold chicken sandwiches, chicken salad, or to pick apart for say chicken enchiladas, or something I'll cook it the night before, store the cooked chicken in the fridge and then just pick it apart before dinner the next day. Place chicken on a cutting board breast side down. 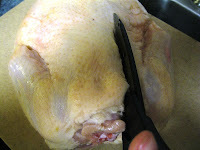 Using sturdy kitchen shears start at the neck bone and cut down the length of the spine on both sides down to the tail bone. You should be able to remove the entire spine in one strip. Turn the bird breast side up. Gripping the opening in the back where the spine used to be, and open up the bird, pressing down firmly at the center to flatten it. In a small bowl, mix together your seasonings. Set a large cast-iron skilled on a burner over medium-high heat. When the skillet is hot, add the chicken breast side down. Try to flatten out the chicken as much as possible to get as much contact with the skillet to sear the meat and seal in those juices! Set the skillet in the oven and roast for 30-40 minutes, or until the thickest part reaches 165 degrees. Serve immediately or let cool and refrigerate for use for cold chicken sandwiches or anything else you can think up! Jan's tip: This method took only about 45 minutes from start to finish (Snipping the spine out and cooking it. If you cut the spine out the night before then bake it for dinner the next day, it should be about 30-40 minutes till dinner. It yielded only a little broth in the pan, because it all stayed in the chicken and kept the meat super moist and tender! Searing it first, really made a world of difference! wow that is just smart, so have to keep this in mind! Let me know how it goes for you if you try it! I'd love to know! I've been doing that for years. I forget who told me about it, but even when I don't take the backbone out of the chicken, I press down hard on the breast with both hands and 'flatten' out the chicken. Then I turn it over and do the same on the back. I don't think it will go in a skillet then, but it certainly makes it lay down. And it bakes faster. Yes, it's a good thing! And it works!! Now I want to try your method! Thanks for sharing, I love it!